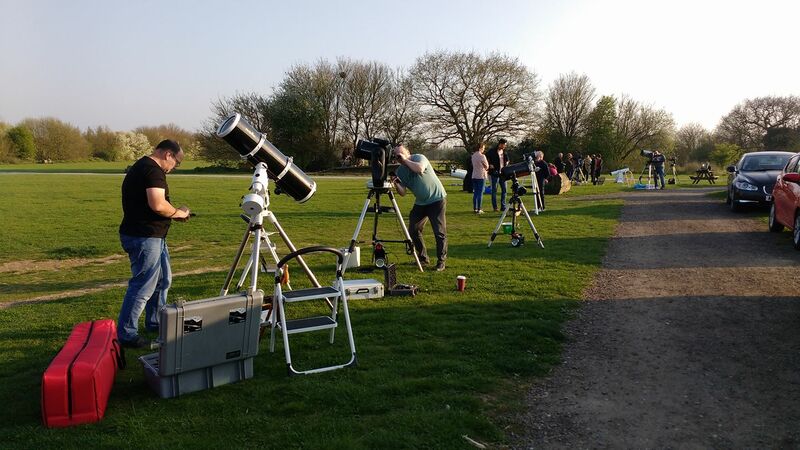 We hold regular public star gazing & solar gazing sessions at Great Notley Country Park and thank Essex County Council and the park wardens for their assistance with these events. 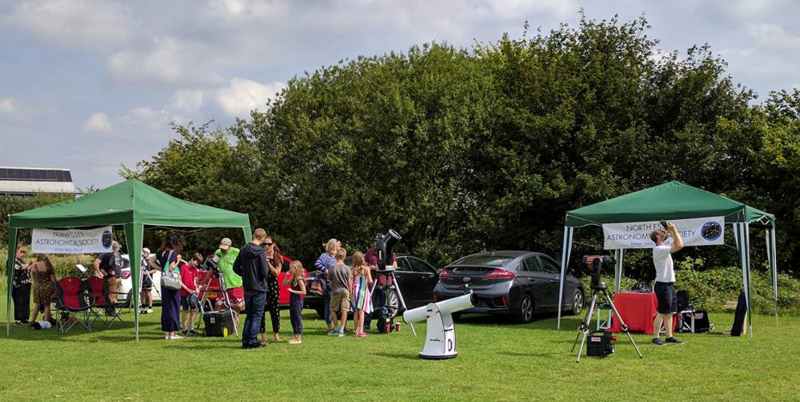 We will have telescopes set up for you to observe the Moon, any visible planets and other objects of interest in the night sky, or to safely observe the Sun for daytime sessions. We can teach you about the constellations and how to recognise them. We can answer any questions you may have about astronomy or telescopes. Star gazing: 6:00pm to 9:00pm (occasionally 10:00pm where noted on the event listing). In the event of rain or severe weather, sessions may be cancelled. Please follow our Facebook and Twitter feeds for information as to whether the event will go ahead, or call the park on 0333 0132900. We aim to post updates on the day, around mid-morning for solar gazing and mid-afternoon for star gazing. If the weather is cloudy or partially clear we will still be available to answer questions, but viewing may be limited. We are ever hopeful of a break in the clouds, but may finish early if the weather shows no signs of improvement. The events are free and there is no need to book in advance, just turn up on the day. Please be aware that normal site parking fees apply. The route from the disabled parking area to the star gazing location consists of tarmac and hard gravel paths. The route to the solar gazing area requires crossing a grassed area. Please contact the park for more information. We try our best to enable everyone to look through our telescopes. If you have mobility issues that make it difficult or impossible to stand, it may not be possible for you to reach the eyepiece. We have a video-astronomy unit that allows live-viewing on a small screen, but it is essential that you let us know in advance so that we can bring it along. You must park in the public car park. 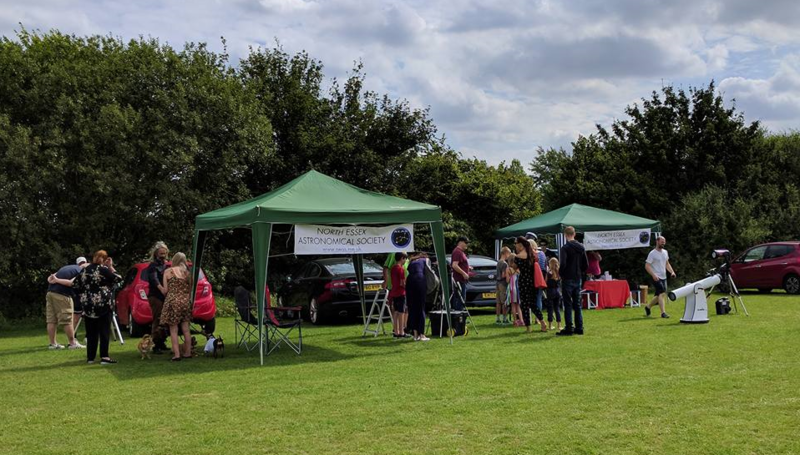 The site is off limits to cars during the event for the safety of everyone, and only our volunteers have the park’s permission to park on site. If you own a telescope and need help with it, you are welcome to bring it along and we will try to assist you. Unfortunately this is not usually possible on busy nights when the sky is clear due to the numbers attending. 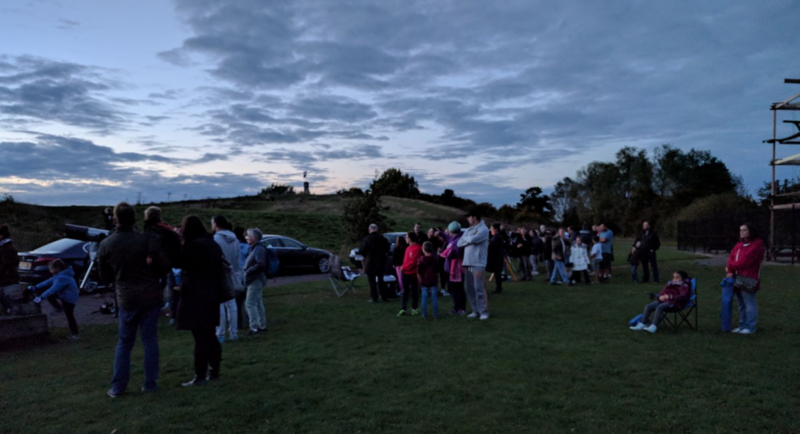 We understand that you may be using a torch to walk across the park but please keep the light shining downwards at all times and keep it switched off around the telescopes. No flash photography please unless you want to see grumpy astronomers! Well behaved dogs are welcome but please keep them on a short leads near the telescopes to avoid accidents. We would like to thank Great Notley Parish Council for their generous support in sponsoring some of our equipment purchases. 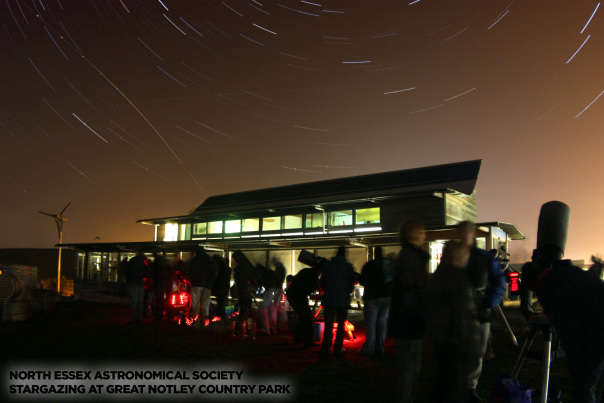 Lilys at Notley (the cafe in the Discovery Centre) is open during solar gazing events, and will also be open at selected star gazing events. Please see the individual event listings for details. 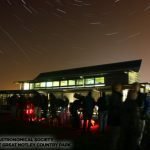 We can be found next to the Sky Ropes behind the main Discovery Centre building for star gazing and in the field to left of the main building path for solar gazing. We usually have a sign pointing to where we are. For more information about Great Notley Country Park and how to get there, click here. A Google Maps link is here. The Discovery Centre is well signposted. For satnav purposes, the park’s postcode is CM77 7FS which will take you directly to the Discovery Centre.